Notes: Lovely clear postmark with nice tidy hand written address. 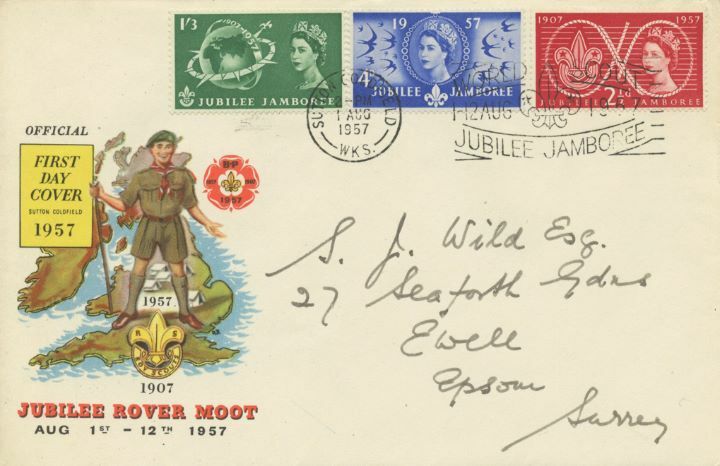 The above Royal Mail Scout Jubilee Jamboree stamps were issued on 01 August 1957 by Royal Mail and feature the following stamp designs: 2 1/2d Scouts Badge and Rope; 4d Scouts coming to Britain; 1s 3d Globe and Compass. The Jubilee Rover Moot first day cover with the Sutton Coldfield Slogan Postmark postmark and features these stamps which can make a very collectible and lovely gift.